BARRETT, Texas -- A fire broke out at an Arkema chemical plant in Crosby that lost power early Thursday after Harvey engulfed the area in extensive floods, police said. The plant's operator had earlier said the facility was rocked by two explosions, but police later described the incident as a "series of pops." Officials said at a press conference Thursday morning that the Harris County Emergency Operations Center received reports of two explosions and black smoke coming from the plant at about 2 a.m.
Assistant Harris County Fire Chief Bob Royall described the explosions as "container ruptures." 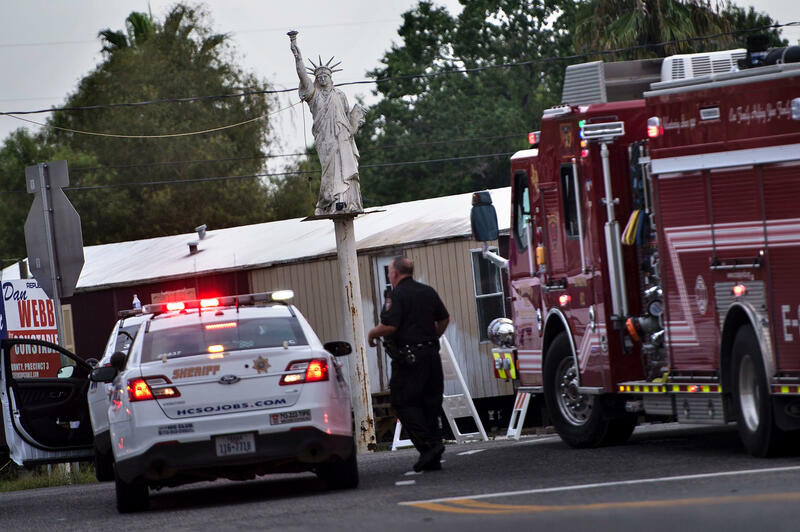 He said different grades of organic peroxides in a semi-trailer caught fire not long after midnight. The fire emitted a 30- to 40-foot flames and black smoke. Royall says officials expect similar reactions in the eight remaining trailers. Arkema executive Richard Rennard told CBS News correspondent David Begnaud that the organic peroxides stored in the containers combust when not refrigerated. Harris County Sheriff Ed Gonzalez says some deputies suffered irritated eyes from the smoke but insisted it wasn't dangerous. "It is not anything toxic," Gonzalez said. "It is not anything that we feel is a danger to the community at all." At a separate news conference in Washington, D.C., FEMA administrator Brock Long told reporters that "by all means, the plume is incredibly dangerous." A spokeswoman for the plant said late Wednesday that the flooded facility had lost power and backup generators due to the flooding, leaving it without refrigeration for chemicals that become volatile as the temperature rises. The plant is about 25 miles northeast of Houston. There was "no way to prevent" an explosion, chief executive Rich Rowe said earlier Wednesday. Gonzalez said the fire would burn itself out. Royall said the fire service was not monitoring the fire -- "that's industry's responsibility" -- and that the company hired a contractor to do aerial monitoring of the smoke to see which direction it was going. The company shut down the Crosby site before Harvey made landfall last week, but a crew of 11 had stayed behind. That group was removed and residents living within a 1.5-mile radius were told to evacuate Tuesday after the plant lost power. "The facility is surrounded by water right now so we don't anticipate the fire going anywhere," Moreno said. Arkema was required to develop and submit a risk management plan to the U.S. Environmental Protection Agency, because it has large amounts of sulfur dioxide, a toxic chemical, and methylpropene, a flammable gas. The plans are supposed to detail the effects of a potential release, evaluate worst-case scenarios and explain a company's response. In its most recently available submission from 2014, Arkema said potentially 1.1 million residents could be impacted over a distance of 23 miles in a worse case scenario, according to information compiled by a nonprofit group and posted on a website hosted by the Houston Chronicle. But, Arkema added, it was using "multiple layers of preventative and mitigation measures" at the plant, including steps to reduce the amount of substances released, and that made the worst case "very unlikely." Daryl Roberts, the company's vice president of manufacturing, technology and regulatory services in the Americas, did not dispute that worst-case scenario but said that assumed all the controls in place failed and strong winds blew directly toward Houston, the nation's fourth-largest city. "We have not modeled this exact scenario but we are very comfortable with this 1.5-mile radius," Roberts told the AP. He added that it mostly resembled less serious scenarios that would affect a half-mile radius and a few dozen people.